There is absolutely nothing sexist, misogynistic or otherwise controversial about these Gamescom screens for Tomb Raider, so we're going to have to make up our own. 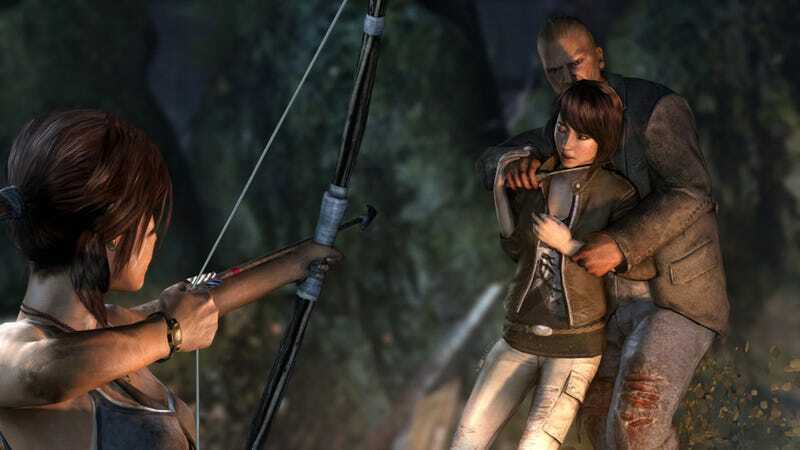 Oh my god, Lara Croft is helping that hardened killer execute that woman! Doesn't work? Okay, let's see if there's anything else we can use here. Oh my god, Lara Croft is stealing things from a corpse. She's obviously a necrostealiac. Not all bearded men are evil, Square Enix! This is not a very good screenshot. Obviously they are biased against clarity and friendly angles. Defacing an ancient idol with candles — British stereotyping at work. First she shoots Bambi's mother in the neck, then they set the forest on fire. Here Lara waits until the deer sees her to fire, feeding off the fear of her prey, that monster. Yeah, I'm trying really hard, but I'm not seeing anything particularly outrage-worthy. Maybe this is just a video game? Nah, what fun would that be?